Something a bit different today for you, I was asked to write a post on Quorn (as the title may suggest) and first let me start by saying I'm the most carnivorous person going, I could seriously give a T-Rex a run for its money but something that got me through living in halls at uni was Quorn so I was happy to do a post on the topic. Not only is it cheaper than meat generally its healthier too & when I was a student these were fairly important factors not only that the thought of eating real sausages freaked me out so Quorn sausage sandwiches cured many a hangover I can assure you. 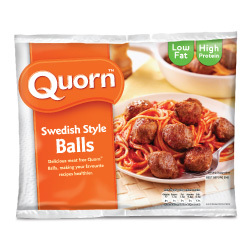 Even though i'm no longer a student I still cook using Quorn, rather than a post drinking cure or budget friendly option I use it mainly these days when I have Vegetarian friends over for dinner. I love cooking for people but I will admit to total meat ignorance ie it's in 90% of my meals & so if i'm having people round for dinner I really don't like to feed the meat eaters meat & give the vegetarian my best attempt at a 'tasty' salad so I prefer to use Quorn & make sure both parties leave my house suitably stuffed & also having friends round is such a communal thing & separating a group of people is a no no for me. One of my favourite recipes to cook with meat or Quorn is Stroganoff, it's probably my favourite meal if my aunt cooks it for me & such an easy one when you have company as it's quick, it's a one pan dish & seriously tasty, so I thought i'd share my recipe with you. 1. Pan fry the Quorn balls in 1tbsp of oil until golden brown, remove from the pan and put to one side. 3. Add the Quorn to the pan & increase the heat to medium & cook for a few more minutes. 4. Add the wine, just enough to make a little well in the bottom of the pan but not too much as you're wasting potential drink! Reduce on the heat by a third. 5. Add the mushrooms, sour cream, salt & mustard & cook for a further 10 minutes. 6. Once the cream has thickened, start to grind the black pepper into the sauce keep adding & tasting until it is peppery enough for you, personally I stand there for about 5 minutes adding pepper! 7. Serve with rice & lots of white wine! So there's one of my favourite meals with a cheaper, healthier, more vegetarian friendly meat substitute! Have you ever tried Quorn & what did you make? If you're not a sausage fan I urge you to try theirs!! I'm a huge fan of quorn! I'm veggie but my boyfriends not, he quite likes quorn - I think because he knows it's healthier than meat! My only dislikes are the 'meatballs' and 'steak', the texture just didn't feel right (too meaty) but my boyf enjoyed them. The fillets, mince, sausages and pieces are every day staples and I also love the escalopes, 'scotch eggs', 'ham slices' and occasionally their ready made lasagnes if I'm too tired to cook! So yeah, I love quorn :) frozen stuff is on 3 for £5 in asda quite often which is great! I'm not a veggie either but I am a bit squeamish with meat...there are only certain things I'll eat but I LOVE them and can't imagine giving them up. In saying that, I'm about one crisis away from becoming veggie and Quorn is something that I keep meaning to getting round to try.